Bikeworks and BW Cycle Studios: 2013 Mamba 29er Has Rolled in to Indian Valley Bikeworks! Come Check it Out! 2013 Mamba 29er Has Rolled in to Indian Valley Bikeworks! Come Check it Out! Trek doesn’t pull any punches with the 2013 Mamba 29er. 29er means that it has 29 inch wheels which make tracking incredible. These larger tires easily pass over rocks and ruts on those challenging mountain trails. The rims are double walled and eyeleted with stainless steel washers, which makes them extremely strong and reliable. 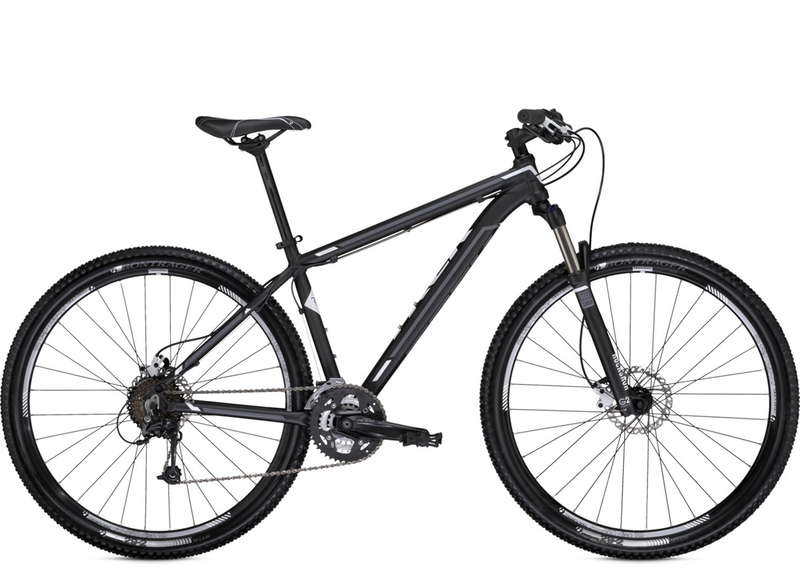 If you’re just starting out in mountain biking, the Mamba 29er should be at the top of your prospective new bike list. Like most of their 2013 bikes, the Mamba features G2 geometry, giving the Gary Fisher Collection of Trek bicycles precise handling at low speeds without compromising high speed stability. Trek has changed the front head tube and the shock crown angle so that it can steer just as quick as a 26” wheel bike. Trek bikes work so well with Shimano parts, and that’s why the entire drivetrain, from the shifters to the cassette, is manufactured by Shimano. The gearing is performance oriented, because the bike tailors to performance oriented cyclists. Haynes Dyno Sport Hydraulic Disc Brakes handle the stopping power of the Mamba, even in wet or muddy conditions. They are lever actuated, and are easy to adjust so you can stop the bike with one finger if you set it just so. Enough about the bike, come down to Bikeworks today and let us put you on a 2013 Mamba. We are located at 500 Main St. in Harleysville. If you want, you can give us a call and we’ll be happy to answer any questions you may have. (215) 513-7550.